The world's first floating U-Wing! This Previews Exclusive U-Wing floats in the air above its themed base! With the anticipation of Star Wars fans around the globe, Beast Kingdom announces the Star Wars: Rogue One U-Wing Magnetic Floating Version Vehicle - Previews Exclusive… the world's first floating U-Wing, unveiled before the release of Rogue One: A Star Wars Story. 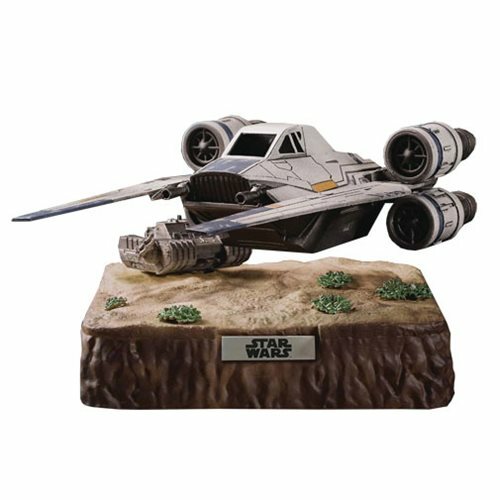 The vehicle utilizes unique electromagnetic attraction and repulsion principles to recreate a U-Wing that floats in the air above its themed base! Requires 8x "AA" batteries, not included. Ages 15 and up.